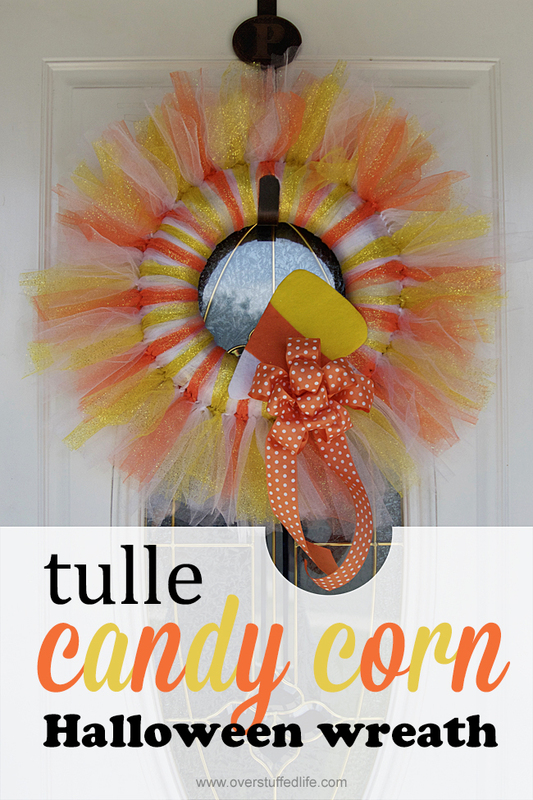 Tulle Halloween Wreath—Candy Corn Style! 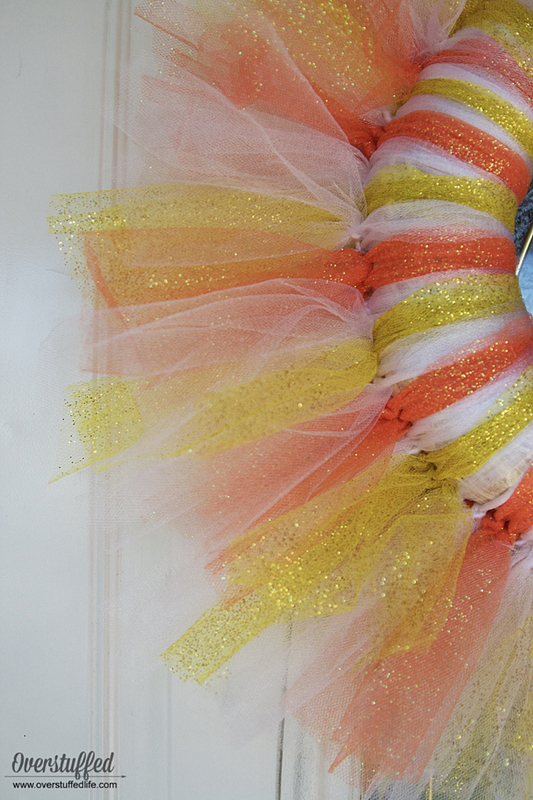 There are a few things you should know about me: I love Halloween, I love candy corn, and I love tulle wreaths. I know that loving tulle wreaths might seem like a weird thing, but even I didn't know how much I loved them until I made my first Halloween tulle wreath a few years ago. I haven't been able to stop since then and now have a lovely collection of Halloween wreaths. Something about the tulle/tutu style of wreath really lends itself well to Halloween. It can look both spooky or whimsical and the best part is that they are super easy to make! I decided this year I wanted to pay homage to my love of candy corn and make a wreath in candy corn colors, and it turned out so cute! Measure from the inside of the wreath form to about where you want the tulle to end when the wreath is made. For this wreath, that was approximately 9 inches. Then cut a piece of cardboard double that size—I used an 18" piece of cardboard for this project. Wrap the tulle around the cardboard, and then cut both ends of the loop. This is the absolute easiest way to get uniform strips quickly. 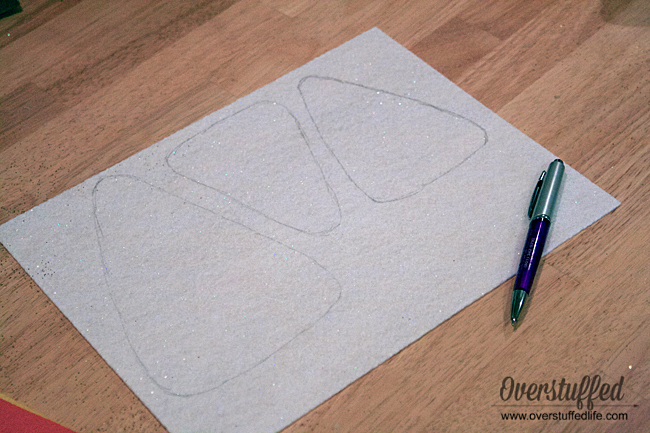 You can measure and cut them one by one, but that will add hours to your project. I don't cut all of the tulle all at once because I don't want to have too many extra strips cut that I won't use. I actually had a different pattern in my head that used a lot more orange tulle. I was trying to more closely mimic an actual piece of candy corn, which is mostly orange. But once I had about a fourth of the wreath tied that way, I realized I hated it because it needed more white. So, I took it apart and made a new pattern. The pattern I ended up using was 2 orange, 2 white, 2 yellow, 2 white, etc. I prefer tying double knots rather than looping the tulle onto the form. Not only is it more secure that way, it uses less tulle. I also really like the way the knots look. 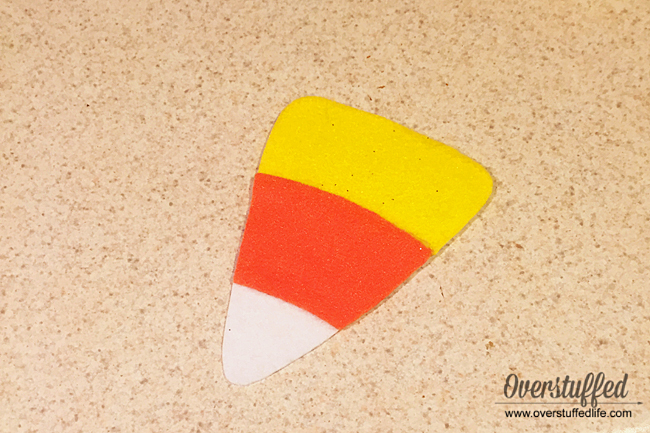 I used a piece of stiffened white felt and just sketched a candy corn shape onto it. I cut that out and then used it to trace the orange and yellow pieces. I used a hot glue gun to glue the orange and yellow to the white felt and voila! A cute little candy corn for my wreath that was also pretty sturdy due to the stiff felt. I just used the orange polka dot ribbon to make my own bow, but you can also purchase a premade bow if that is easier. Once the bow was finished, I glued it all on to the wreath and hung it on the door. Because tulle Halloween wreaths are my favorite. 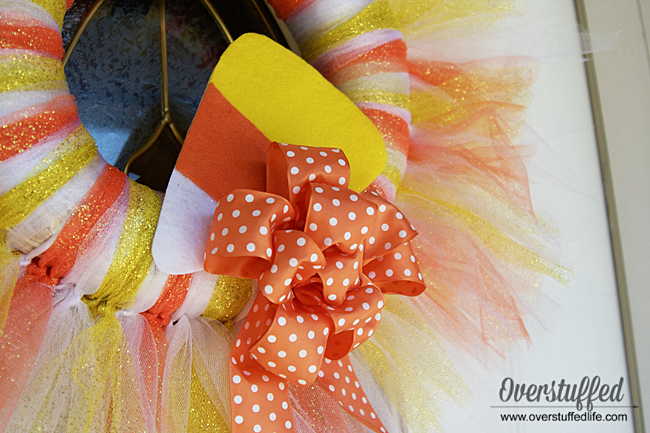 See my other Halloween tulle wreaths!